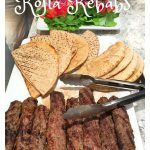 Kofta Kebabs are a popular Middle Eastern delicacy: skewers of spiced-up ground lamb or beef, served with fresh vegetables, pita and garlicky yogurt sauce. 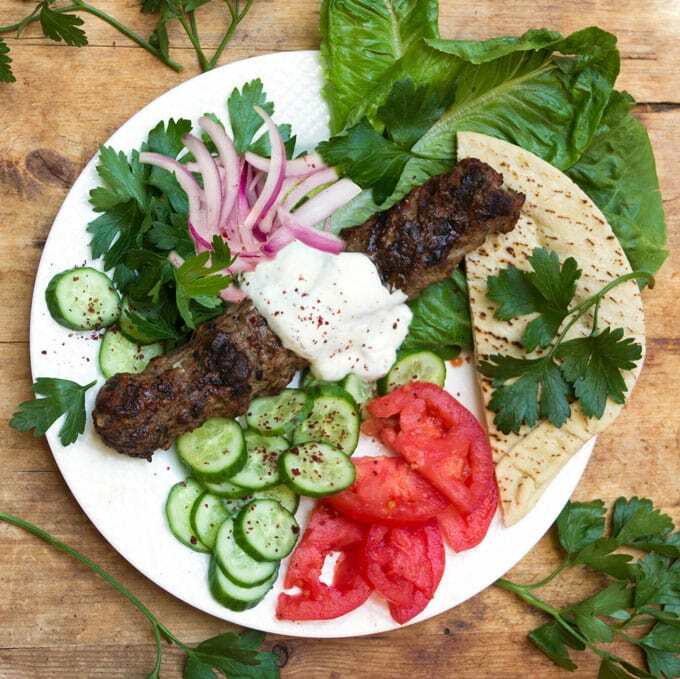 Here’s how to make authentic grilled Turkish Kofta Kebabs at home. 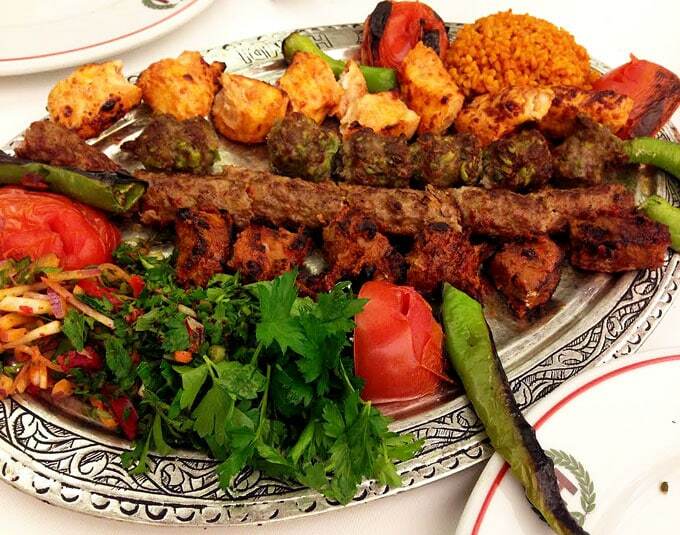 When I was in Istanbul kebabs were everywhere: shish kebabs: grilled chunks of meat or chicken on a skewer; doner kebabs: meat cooked on a rotisserie and sliced off for serving; and kofta kebabs: ground lamb or beef shaped onto skewers and grilled. They were served with tomatoes (raw or grilled), fresh parsley, assorted salad ingredients, seared peppers, rice or pita, and tahini or yogurt sauce – perfect complements to the rich, flavorful meats. Here’s an iPhone photos of one f my kebab dinners in Istanbul. It was as delicious as it looks! 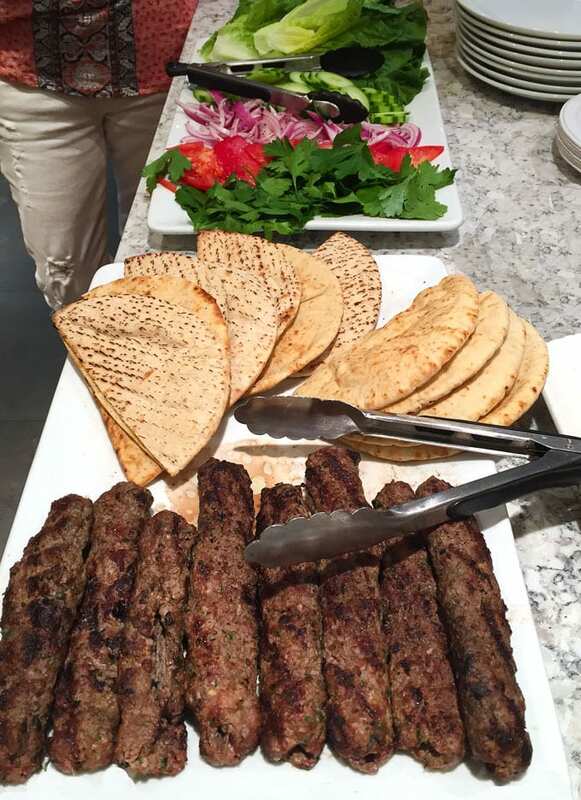 When I returned from Istanbul I couldn’t not stop dreaming about delicious kofta kebabs. I finally got around to developing a recipe and here it is! Kofta is a mix of ground meat, herbs and spices that’s formed into a meatball or meatloaf. 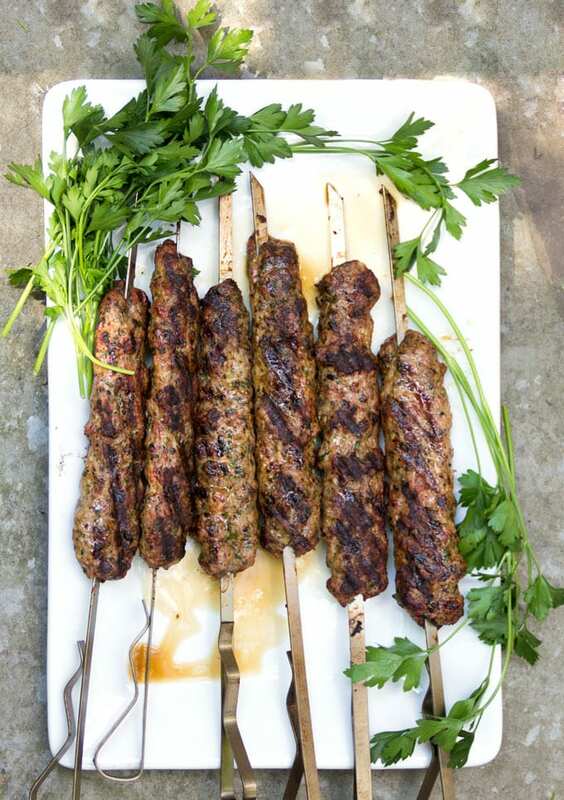 Kofta kebabs are formed around a skewer. 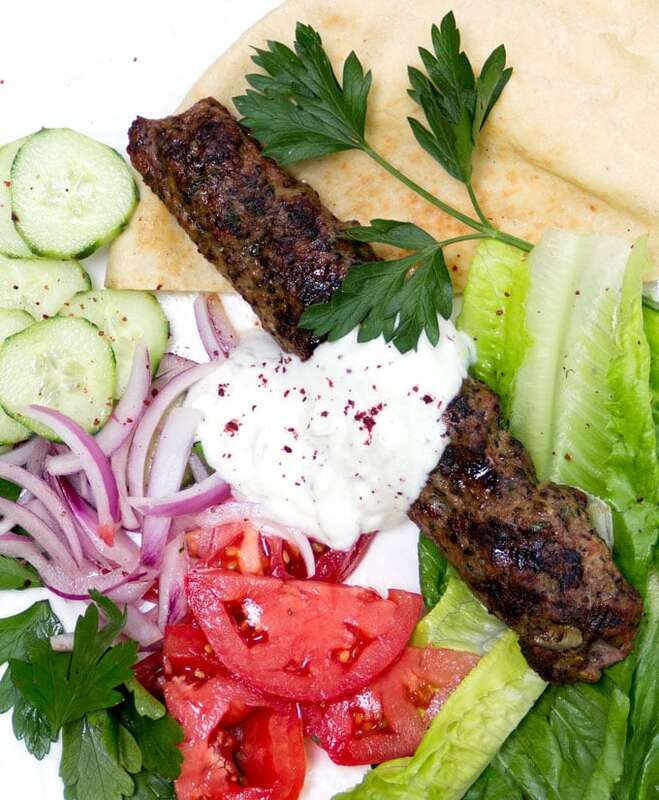 These Turkish kofta kebabs can be made with either ground lamb or beef. I’ve done it both ways with great success. The meat is mixed with finely chopped onion, parsley and spices. Next comes the fun part, shaping the kofta around the skewers. Keep a bowl of ice water handy to dip your hand in, if the meat starts to stick to you. Slide a portion of meat onto the skewer and stand the skewer upright – pointy side down – holding the top with one hand. 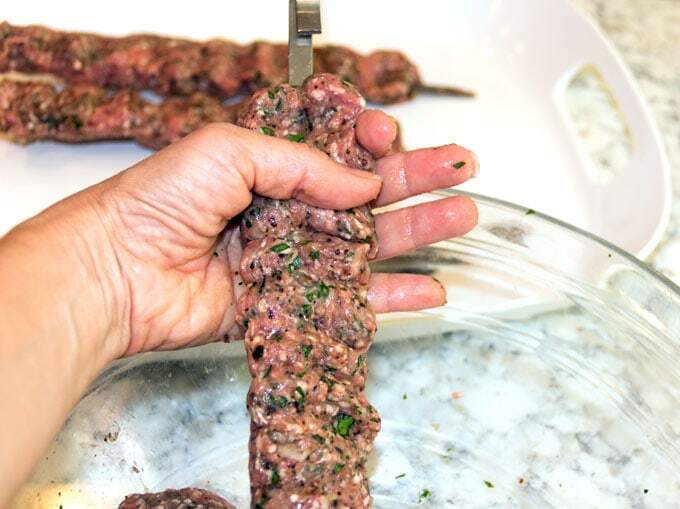 Use the other hand form the meat into a long, ridged, sausage shape by gently squeezing it from top to bottom, and pressing the side of your thumb in as you go, to make the ridges. Flip the skewer over and repeat the process, squeezing and ridging the other side. Keep flipping and repeating until you have a long, flat, ridged kebab. If you want more instruction, check out this YouTube video. I like to serve these kofta buffet-style, with the kebabs and warm pita on one platter, the fresh vegetables on another platter, and the garlicky yogurt sauce in a bowl on the side. This is a fantastic dish for entertaining. Set it all up and let people help themselves. It’s always a big crowd pleaser with my friends and family. If you try this recipe I hope you’ll come back to leave a star rating and a comment and a rating. I’d love to know what you think! Grilled skewers of spiced-up ground lamb or beef, served Turkish style with fresh vegetables, pita and garlicky yogurt sauce. You will need long 6 skewers, preferably flat (12 inches or more) or 12 shorter ones. If you use bamboo skewers, soak them in water first, for at least 30 minutes. Make the Garlicky Yogurt Sauce: Mix all the ingredients in a medium bowl. Store in the fridge until you’re ready to use it. Make the Kebabs: Finely chop 1/4 cup of the parsley leaves. Set the rest aside for the salad. In a large bowl combine lamb, onion, chopped parsley, urfa pepper, 2 teaspoons sumac, and salt. Work the ingredients together with your hands for a couple of minutes until they are fully incorporated. Divide the meat mixture into 6 or 12 equal portions, depending on the size of your skewers. You can simply skewer them them squeeze them into long sausage shapes or you can try the ridge techqnique: Keep a bowl of ice water handy to dip your hand in, if the meat starts to stick to you. 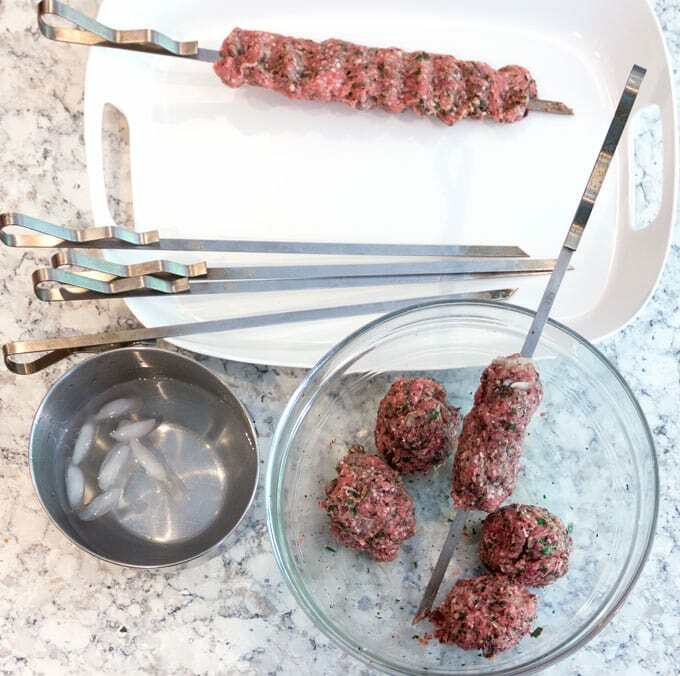 Slide a portion of meat onto the skewer and stand the skewer upright – pointy side down – holding the top with one hand. Use the other hand form the meat into a long, ridged, sausage shape by gently squeezing it from top to bottom, and pressing the side of your thumb in as you go, to make the ridges. Flip the skewer and repeat the process, squeezing and ridging the other side. Keep flipping and repeating until you have a long, flat, ridged kebab. Store the kebabs in the fridge, covered with plastic wrap, until ready to grill. Arrange Accompaniments: Put tomatoes, cucumbers, onion, parsley and lettuce in piles on a platter. Sprinkle onions and cucumbers with 1/2 teaspoon sumac. Grill the Kebabs: Heat the grill to high. Charcoal grilling is more authentic but gas works well, too. Oil the grates of the grill to prevent sticking. Grill the kebabs for one minute on each side to seal them. Cook them for about 8 minutes longer, flipping them after 4 minutes. Turn off the grill and warm the pita on the hot grates for a few minutes, while you unskewer the kebabs. To Serve: Carefully remove skewers (they’ll be hot!) and set meat on a platter with the warmed pitas. Serve with accompaniments and garlicky yogurt sauce. Divide remaining 1/2 teaspoon sumac, sprinkling some over meat and some over the yogurt sauce. My mouth is watering just thinking of these…… I always thought I had the best kebabs in Greece. Who would’ve thought I could top that in my very own kitchen. Very good, a hit with the family. Only used half the lamb and plenty. Mixed the meat mixture evening before and flavours lovely. All enjoyed the sauce, really complemented the dish. England. Brilliant recipe, works really well. Thank you very much, but I can’t believe the yogurt you suggest is ‘plain Greek yogurt’. This dish is accompanied by -as with most kebabs (if they are made with fattier meats), simply ‘plain’ or as we used to call i in the UK (and in the USA): Natural Yogurt. …meaning something that will contrast with the fattiest. Th best natural yogurts in Turkey come from Silifke and Edirne – two totally different corners of the country! By adding strained yyogurt to this dish (I presume tha’s what you mean by Greek yogurt – that newly invented term) yo are going to create ‘cream on top of thick cream’ effect! Keep up the good work, and thank you, again! For Boston folks….You can get sumac at World Market in Framngham’s Shopper’s World. I made a similar recipe but did not add onions. Mine came out v dry. I’m not sure if it’s because we bbq’d them for too long or whether I didn’t add onions OR if my mince wasn’t fatty enough. Any thoughts? YOU NEED 20% FAT IN THE MEAT .. This was soooo good. I didn’t have the spices so I used the substitutes. This is a keeper recipe and it is really fresh. What can you sub the Urfa pepper with? Urfa has moderate heat and it’s a little smoky. I would suggest that you combine Aleppo pepper or crushed red pepper flakes with sweet (not hot) smoked paprika – half and half. You can also simplify and just use crushed red pepper flakes, which are easy to find, but they can be pretty hot so you should probably cut the amount in half if you do that. Another fantastic recipe. My husband said these were the best he’s ever had. Thanks for letting me know that you and your husband enjoyed the recipe so much Eva. I’m thrilled to hear it. You should change the sauce to its real name. It’s called tzatziki and are of Greek origin. Which is of course the origin (and phonetically spelling) of how it entered into Greek language inn the 1930s: Tzatziki. Lisa, these are gorgeous kofta kebabs and packed with flavor. I would love to make these using ground lamb. Yes, I think visiting Istanbul expanded my concept of the word Kabob! I love the idea of making them with ground lamb. Sounds delicious. Always a favourite – love your yogurt sauce – look forward to giving this a try – thanks Lisa. I ate em…and they’re awesome!